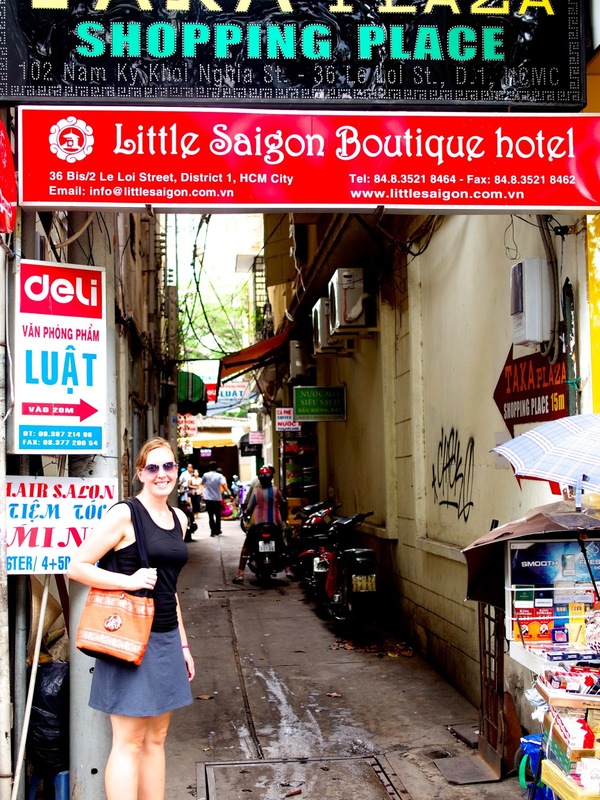 Have Wife Will Travel: Sensational Saigon! 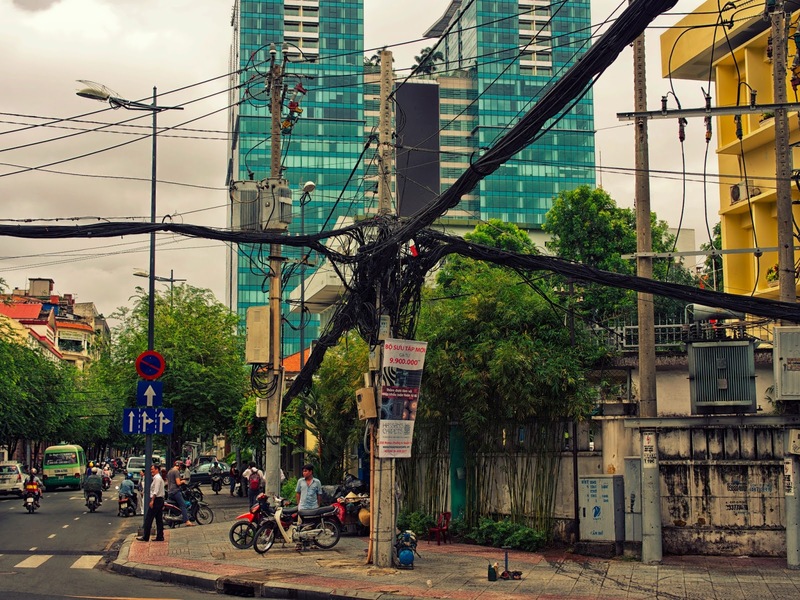 After a perfectly comfortable 7 hour bus ride from Phnom Penh, we arrived in Saigon (officially named Ho Chi Minh City, but still called Saigon locally). The bus involved a surprising and delightful crossing of the Mekong River (our bus just drove right onto a rusty ferry and crossed the river), as well as an incredibly easy border crossing out of Cambodia and into Vietnam. 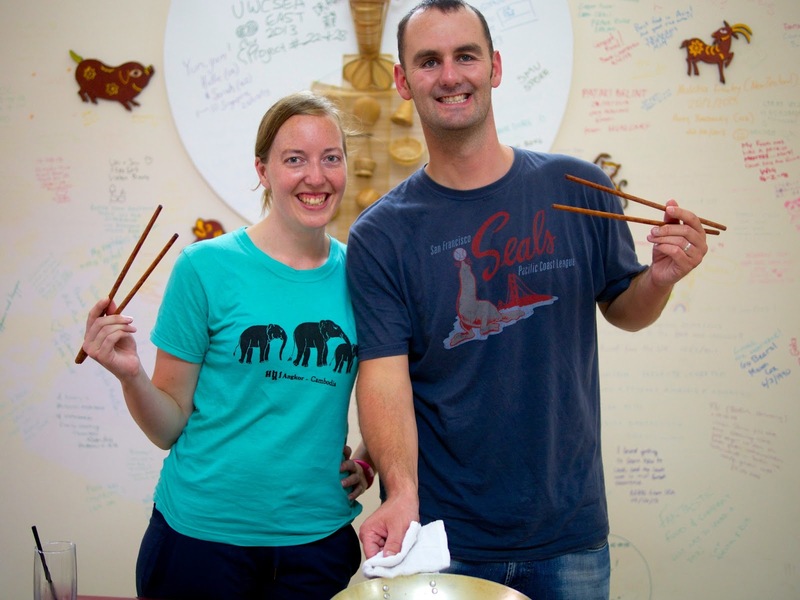 And we met lots of interesting travelers (Hi Ben and Makenna!) and expats on the journey over. We asked the guy in front of us (now a Saigon local) for any tips on crossing the street safely and his advice was, "don't think about it. Just go and don't panic." We got off the bus, crossed the street, and I promptly panicked (go figure!). From there forward, I closed my eyes, held Cory's hand and just started walking, while the cars, trucks, scooters and cyclos zoomed past us. 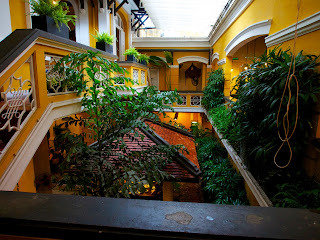 All the most popular attractions in Saigon were a stone's throw from our hotel (and walking all week turned out to be great, as the taxi drivers tend to fleece tourists whenever possible). We were able to walk (via nice, wide sidewalks, which we haven't seen since Tokyo!) 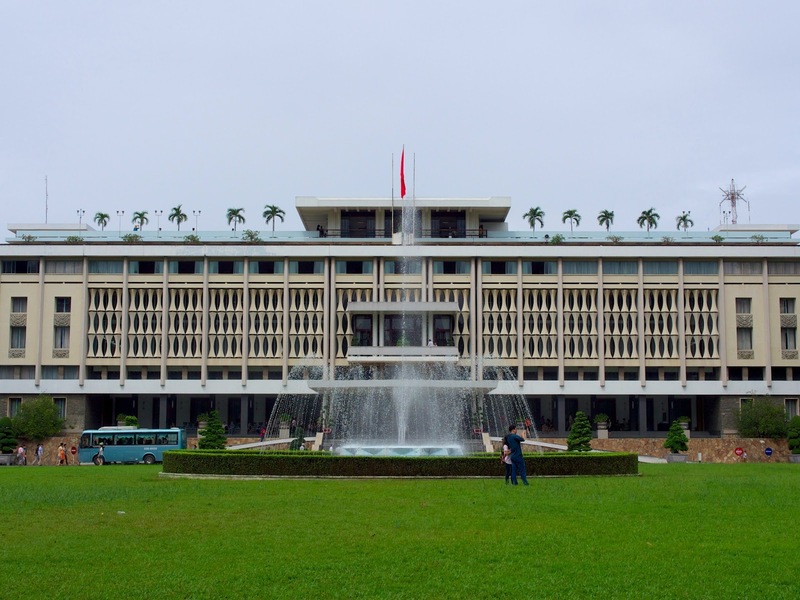 to the Reunification Palace, War Remnants Museum, Saigon Zoo, Notre Dame Cathedral, and the Ben Tahn Market. 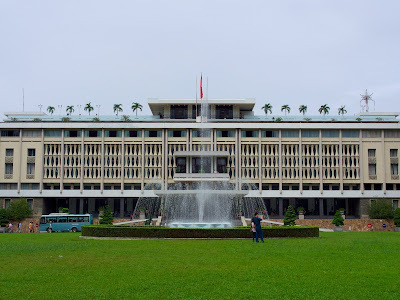 One of the most popular sites in Saigon is Independence Palace (or Reunification Palace as its sometimes called), where the Vietnam War ended when the Northern Vietnamese drove their tanks through the palace gates and took the south. The palace itself was built and decorated in the 1960's and nothing has been changed since then. It's quite something to step into the 60's, though the point is lost on some, such as the tripadvisor reviewer that said it was "gaudy. They should really update the decorating." We also spent a morning at the War Remnants Museum, which opened in 1975, just 6 months after the war ended, as a place to showcase atrocities commited against the Vietnamese people (by the Americans). In the ensuing years, it has become a less uncomfortable attraction for Americans (I would imagine), though certainly a one-sided take on the war, with exhibits such as "Agent Orange Aftermath in the US Aggressive War in Vietnam" and "The World Supported Vietnam in its Resistance." To their credit, the museum curators did include several photos of Americans protesting the war, and really highlighted that the war was waged by the US government, and not all the people. We found it to be the most interesting photos-only museum we have ever been to! As we have decided that cooking classes are totally in our budget (as long as they are less than $25 per person for a day), we indulged in a cooking class at Cyclo Resto restaurant and cooking school. They picked us up in cyclos, took us to the market to choose the ingredients for our dishes, and then we spent a few hours cooking a feast! We made fresh spring rolls with shrimp and pork, 5 color soup, morning glory sauteed with garlic (not my fave! ), lemongrass chicken, glazed pork ribs, and sliced pineapple for dessert. We got to enjoy our meal with our only other student, a lovely woman from Japan named Yuki. It was a treat to get to talk with someone about Japan after enjoying our trip there in April! We spent a less enjoyable afternoon at the Saigon Zoo, which we really went to because it was only 40 cents each, and the only shade we could find to escape the heat! The zoo itself was pretty sad, with very old enclosures and stressed-out looking animals. The highlight by far was when we were looking at the monkeys in their big house, and realized there was a lot of rustling in the trees behind us. We turned to see a family of escaped monkeys frolicking just outside the exhibit, much happier than the ones inside. When we moved on to the crocodiles, lions and tigers, we crossed our fingers and hoped the escaped monkeys were not indicative of a bigger problem! The weather was quite warm, but every afternoon around 1pm, the skies would open up and drench the city. We spent more than one lunch hunkered in to stay out of the warm, romantic rain. And the one day the rain didn't cooperate timewise, we felt blessed to be running past the Museum of Ho Chi Minh City: not the best museum, but a great rain shelter for 30 cents each! We had the joy of celebrating our 2nd wedding anniversary in Saigon, and spent it in style with cocktails at sunset on Bitexco Tower, followed by dinner at the Temple Club. Little Saigon Boutique Hotel: crazy well-located, charming little hotel! 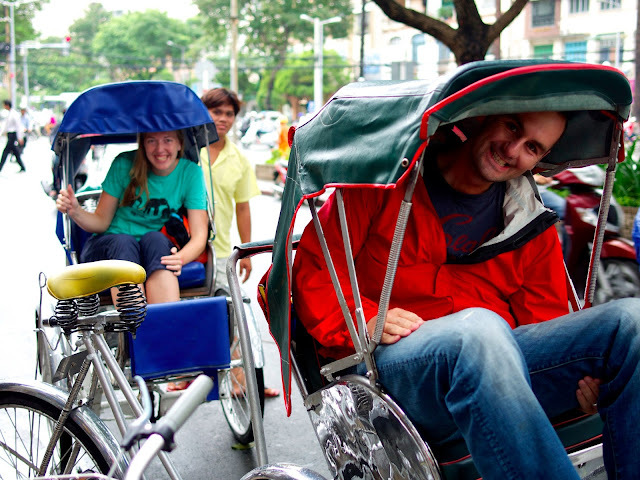 In 5 days, we saw all the most popular parts of Saigon, all walking distance from our hotel. It's located down a little alley (where you will get run over by a scooter if you don't pay attention), so it's nice and quiet despite being in the center of everything. Cyclo Resto Restaurant: Great little dinner restaurant, down an alley in the center of town. They have a single menu each night for $6 per person (and $1 for a large beer if you'd like. We liked! ), and a great cooking class for $23 (including cyclos to the market for shopping, learning how to cook 5 dishes, and free t-shirt...a fantastic deal, and a very fun day!). L'Usine Cafe: A fancy little cafe hidden down a nondescript back alley then up a flight of stairs. We had wonderfully filling Anniversary brunch in style with the Saigon's hipster crowd. Temple Club: Wonderful, incredibly charming and memorable restaurant where we were fortunate to celebrate our 2nd wedding anniversary (thanks, Dad and Sherry!). 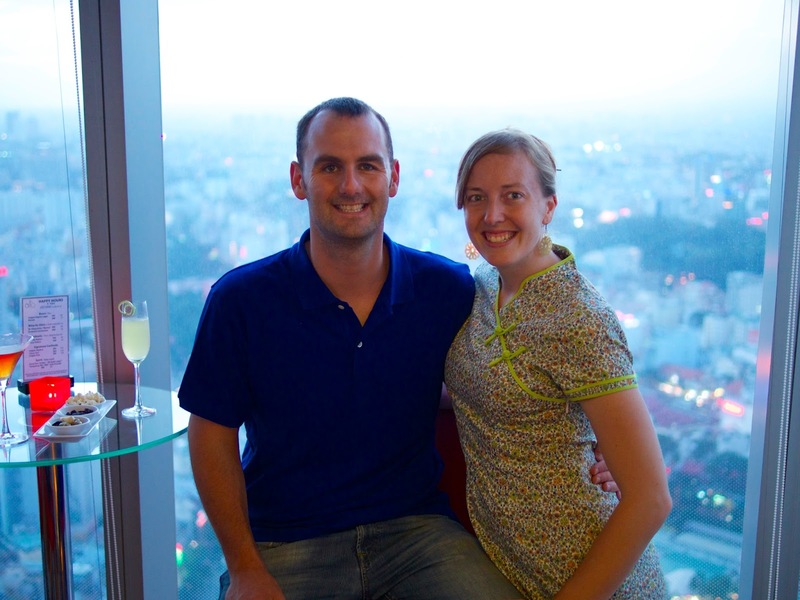 Sunset drinks at the bar on top of Bitexco Tower: There's a bar just above the level of the helipad that is a wonderful place to get a happy hour cocktail while watching the sun set over Saigon (and you save on the entrance fee from the tower's observation deck). Definitely a favorite!